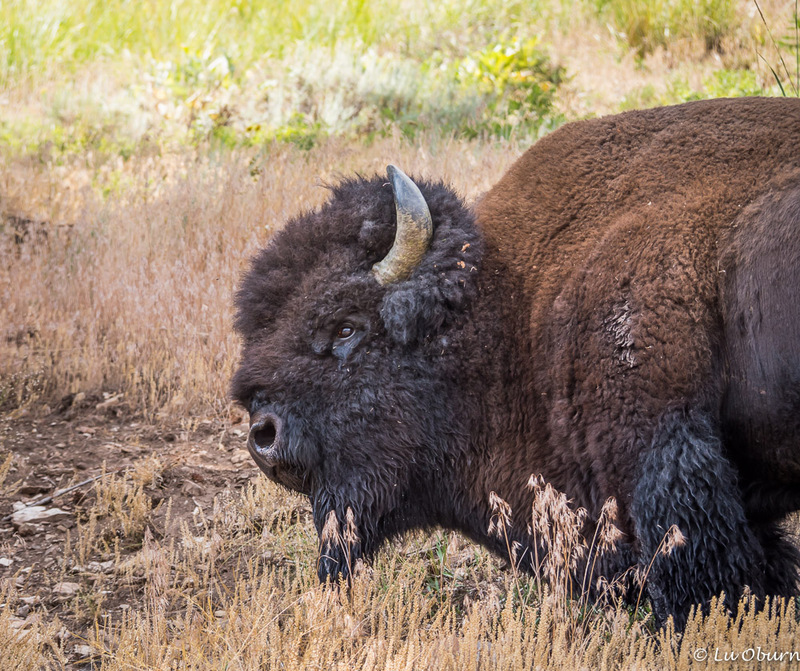 Life as a Yellowstone Forever volunteer at the Lamar Buffalo Ranch has been fascinating – intellectually stimulating, spiritually enriching, a kindred spirit gathering, if you will. There is a flip side, however, to this invigorating environment. It is fast-paced and can leave one a bit fatigued at the end of a long day, but we believe the rewards have far outweighed any weariness felt. As someone who longs to write about the wisdom gained this summer, sadly my schedule and being “off the grid” at the ranch has denied me the time. It seems I will be revisiting my Yellowstone adventures long after we leave on September 7th, which we allow me to reflect upon a summer lived on this landscape and how my spirit has flourished from this intimate exposure. 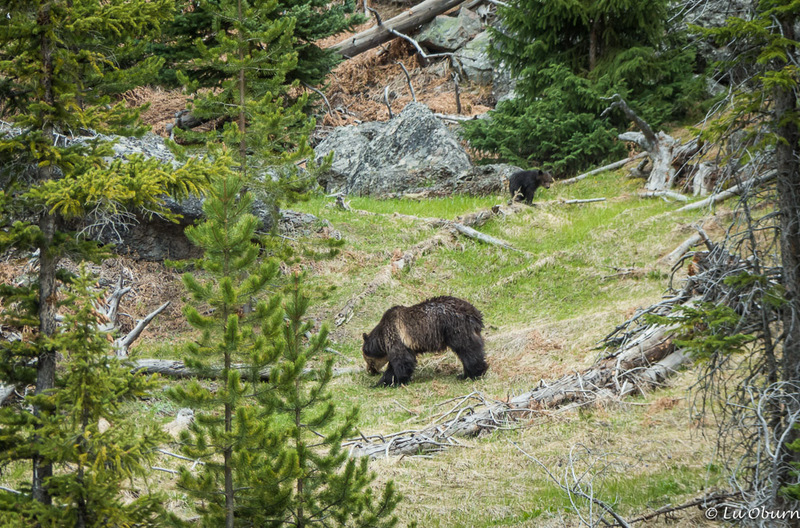 Until I have time to sit down and write a proper blog post on life here in the Greater Yellowstone Ecosystem (and I have so much material with which to entice), I thought I would share some of the summer wildlife sightings we’ve seen in this magical wonderland. 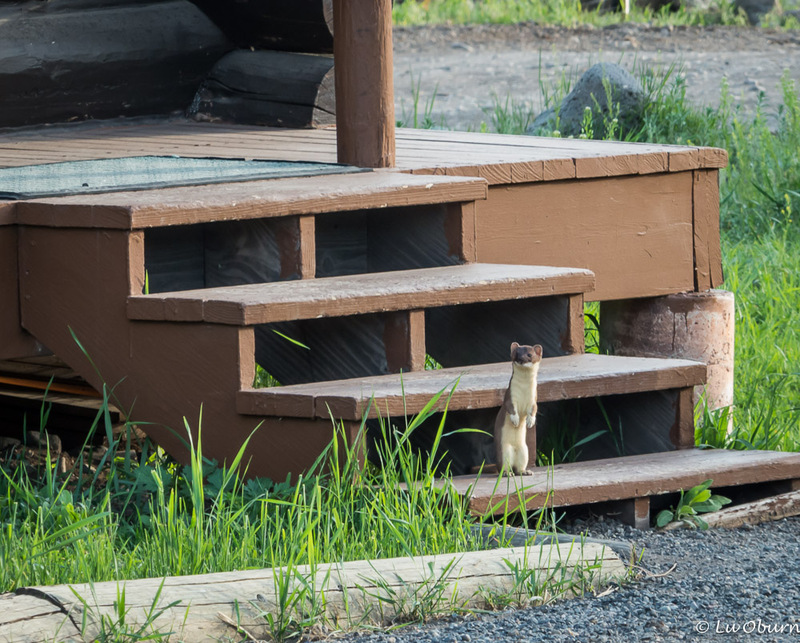 Although I didn’t have the lens to properly snap this crafty weasel’s photo, he reluctantly came out from under a cabin and posed for me. I think he got weary of me stalking him! 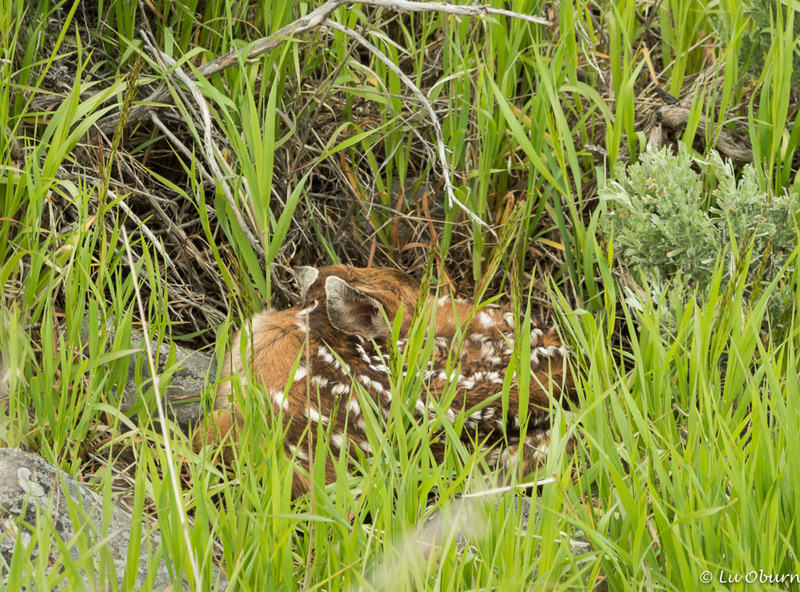 I almost stepped on this fawn during a morning walk on the Buffalo Ranch grounds. 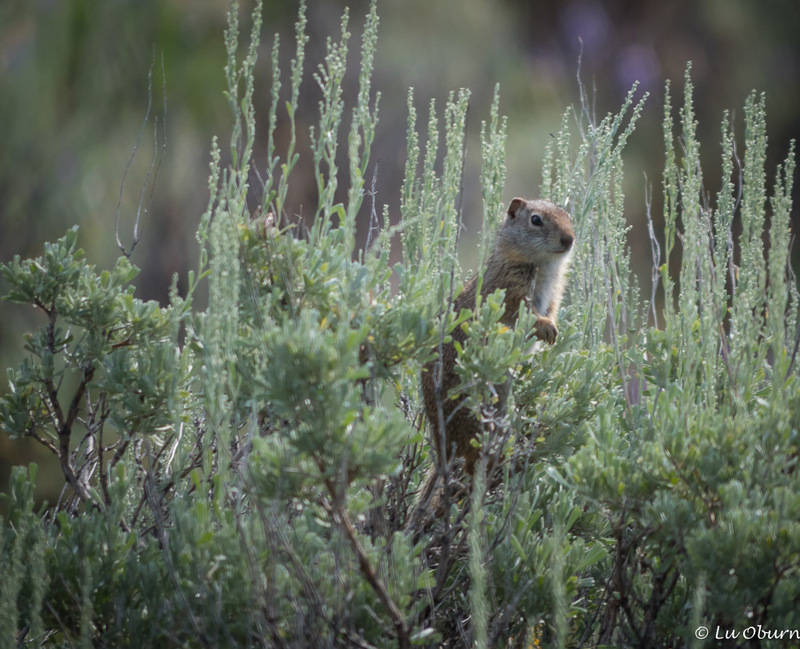 Her mama most likely hid her in the sage to protect her from predators. 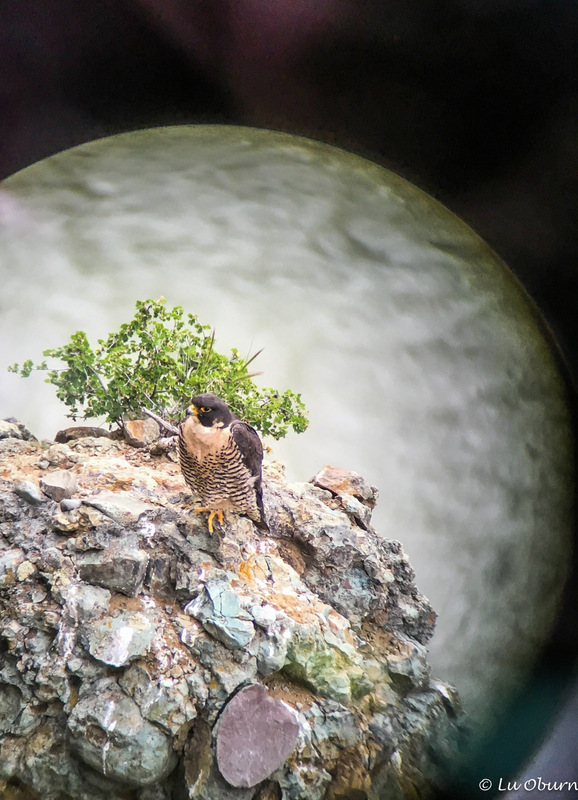 Peregrine falcon nesting above the Yellowstone River. Terry was looking at him through a spotting scope and used his iPhone to take this shot. Mama grizzly and her cub in the upper-right corner of the photo. We were caught in a huge bear jam so I jumped out of the car and grabbed this photo. 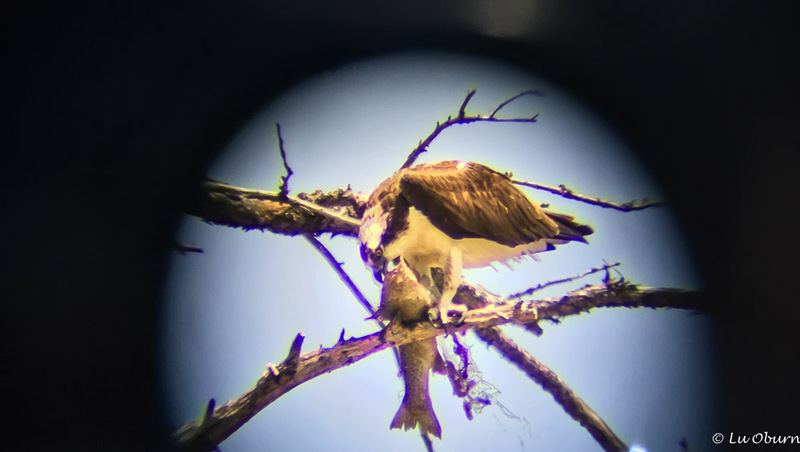 Another predatory bird, an osprey with a meal, who Terry captured with his iPhone through a spotting scope. 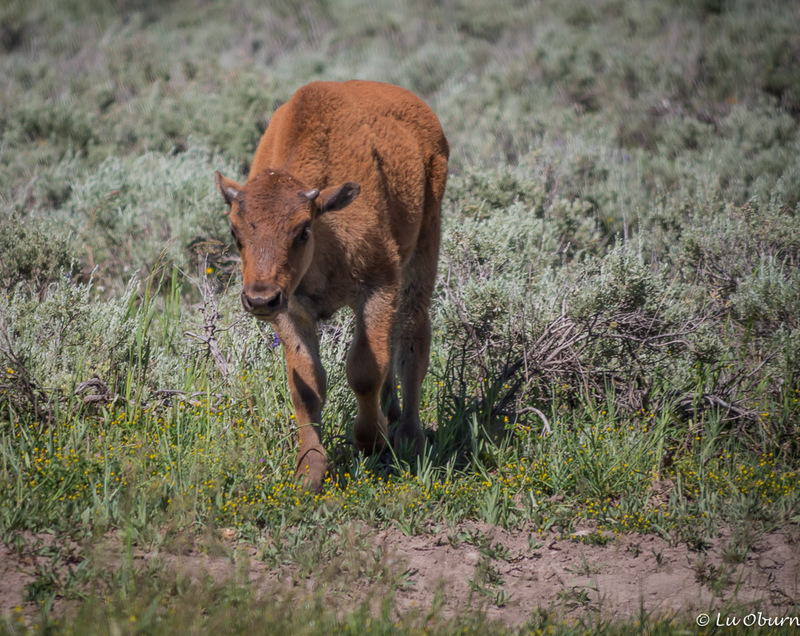 This little cutie was found up in the Beartooth Mountains and couldn’t seem to get close enough to me for a chance to get his photo taken. What an adorable marmot! 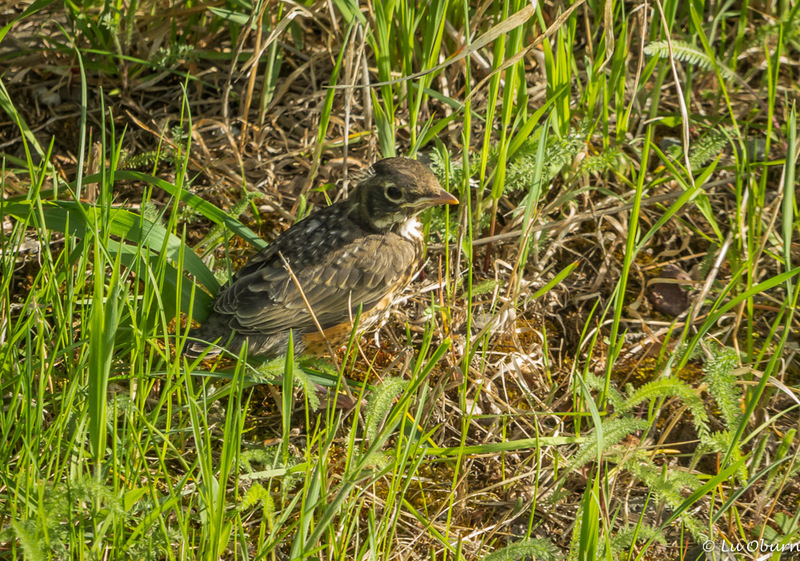 This little fledgling, the last robin to leave the nest, was found later that day, having been attacked by a Uinta squirrel…RIP little one. 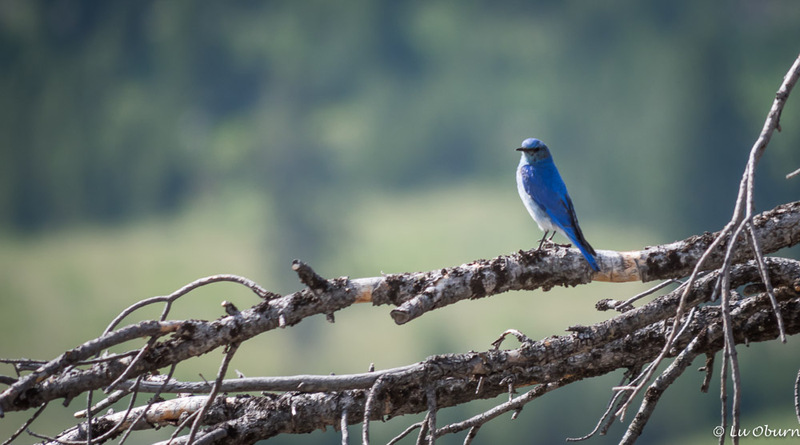 This mountain bluebird seemed to be toying with me as I patiently waited for him to land on a tree branch. 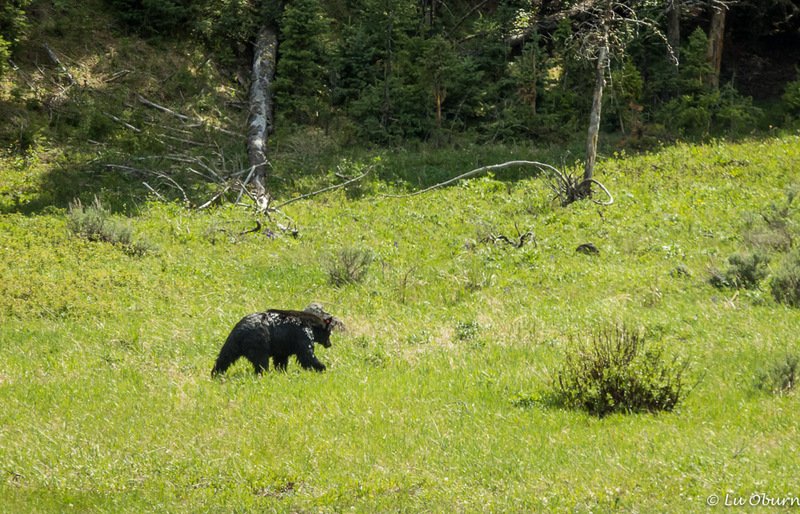 This shiny black bear had just gotten out of Phantom Lake, romping through the water, as I sat in a bear jam. Notice the red ear tag. This massive bull bison walked down the road, right by us, and up on the hillside during my bison class. 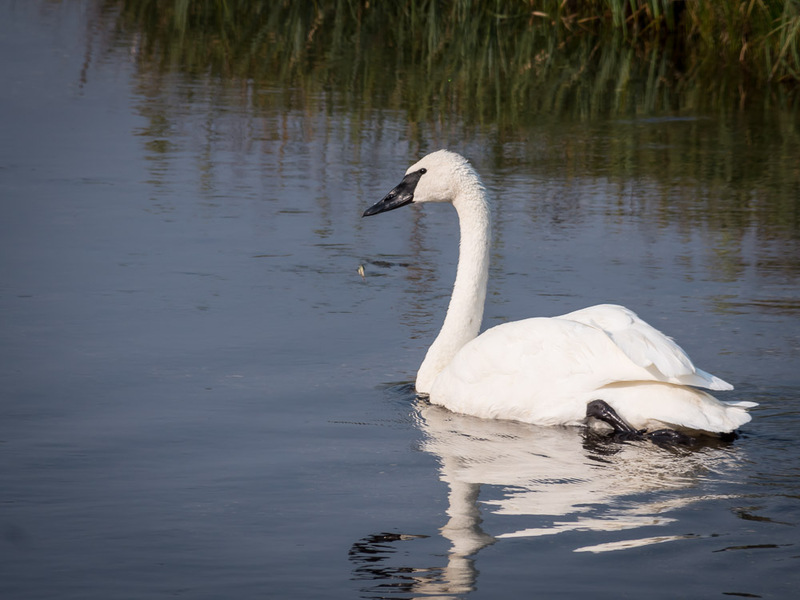 I waited until August to finally see this magnificent bird, the trumpeter swan. Thank you, LuAnn. 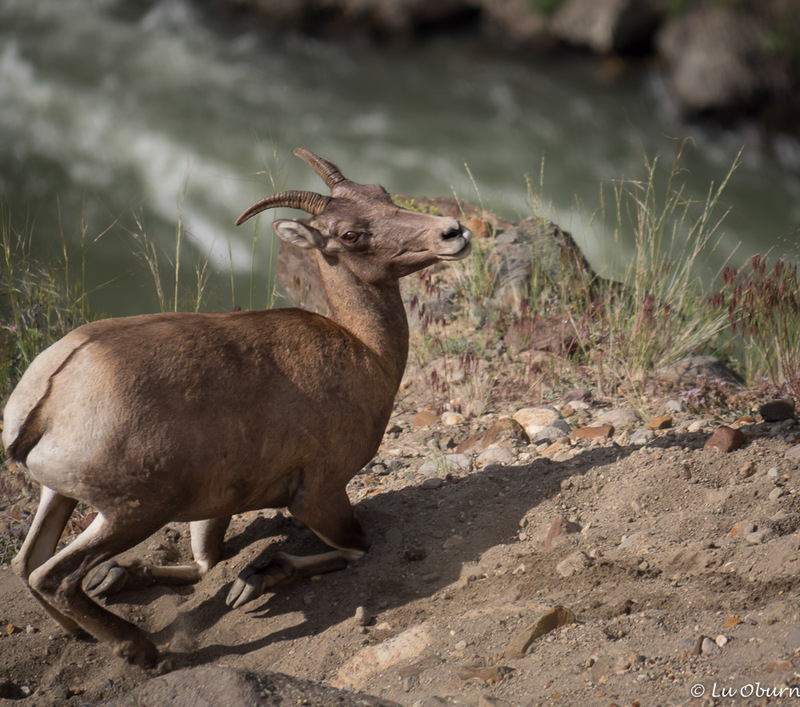 Your photos are wonderful, but the bighorn photo is perfect! I love the angle and the look in its eye. Yellowstone Forever has been incredibly lucky to have you and Terry this summer. I look forward to your future Yellowstone-inspired posts. Thanks Julianne! I think the bighorn is my favorite as well. So love your wildlife photos. 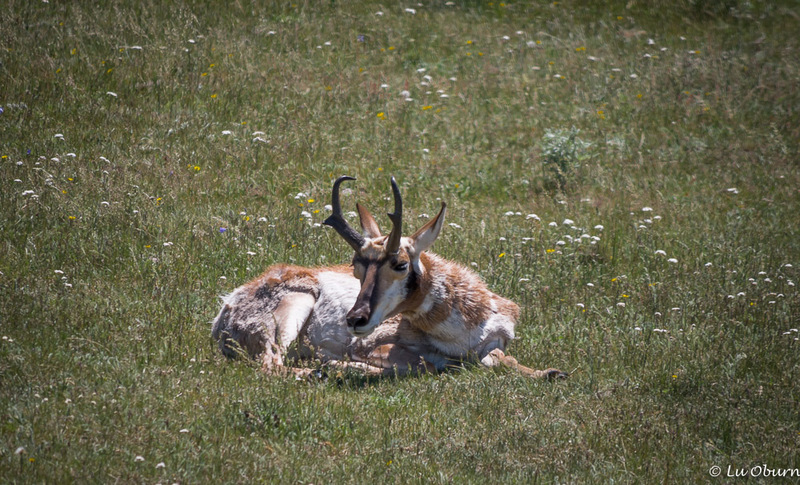 Thank you for taking the time to share them with us, your fans and fellow YNP enthusiasts. I can hardly wait to read about it in depth LuAnn. I can see how spiritual an experience like this must be! I would love to do something similar some day. You would love it Nicole! Thank you for this wonderful tour of the wildlife. Looking forward to your future posts about Yellowstone. Thanks Roger. Yes, the summer is drawing to an end rather quickly. We are planning to meet up with friends in Glacier NP, provided the smoke from the fires north of there don’t keep us away. Remind me when you two will be returning to San Elijo. Looks like the new camera (and the photographer) are doing a wonderful job! 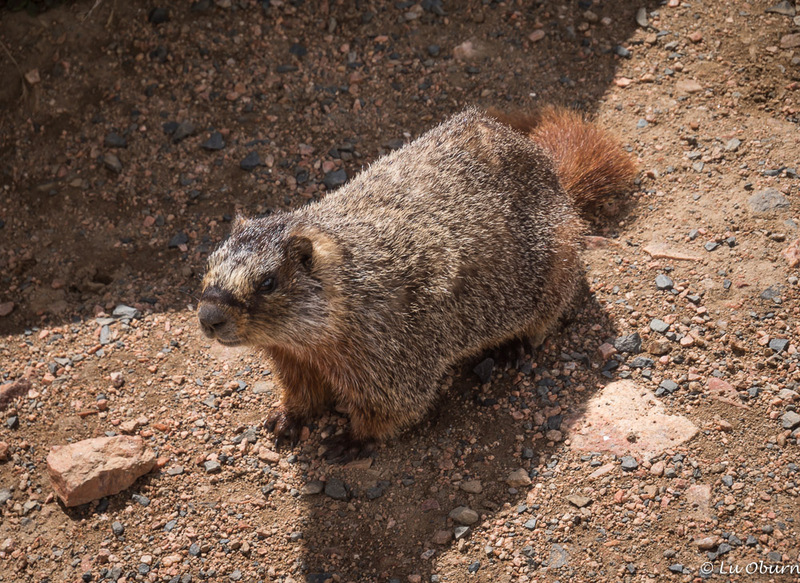 We’ve never seen a weasel, and have yet to see a marmot this summer in CO, although we have in years past. I’ve tried for weeks now to get a good photo of a mountain bluebird, but they just don’t sit still long enough. You did great! Hope our paths cross this fall. Thanks Jim and Gayle. We are really enjoying the new camera. Terry has banned me from visiting Bozeman Camera for the rest of the summer and has told Tanner, the guy who sold me the camera, that he is not allowed to speak to me anymore. 😉 Hope we meet up with you two in Zion. Beautiful photos, LuAnn. You are Terry must be having a great time with nature in Yellowstone. What a life! No need for words when you have photos like these….fabulous. WOW….that photo Terry took looks like it was taken by a very expensive lens. Great job, Terry! Thanks Marsha. Looking forward to catching up with what the two of you are doing. Thanks Frank! Hope you and Margee are having a great summer. These photos are a great taste of what is to come. Looking forward to reading more. What a teaser! Looking forward to your in depth stories, but, oh, what a treat to see such beautiful variety of wildlife! We’ve had a pretty amazing summer Lisa. Hope you and Hans are having the same. Look forward to catching up on your adventures soon. Oh, that weasel is precious!!! All of the images are wonderful and give a good sample of how rewarding your time there must be…. but that weasel —- have you given it a nickname? Isn’t he wonderful? I stalked him for several weeks before he finally posed for me. I haven’t given him a nickname but I should. Hope all is well with you Z! Thanks Pam. Looking forward to catching up with your adventures this summer. Can’t wait to work and volunteer in Yellowstone!! My pleasure Sylvia! When we have decent internet again I look forward to catching up. Hope you had a wonderful summer! I understand the challenge of being disconnected—we’ve had the same experience on Lopez this summer (no connection at all unless we’re at the library!). It sounds as though you’ve had a beautiful, spirit-enriching summer. You’ve certainly seen (and photographed) an incredible variety of wildlife. That marmot is so cute! I can’t wait to hear the behind-the-scenes stories. The lack of connectivity has been the only downside, although it also has been nice to be disconnected from all the chaos going on in DC. So good to talk to you last night. I look forward to catching up on your blog posts soon. Great collections and well taken. I can relate to no connectivity but you are in the best landscape to be disconnected from the world. Thanks MonaLiza. It has been a good summer. Our thoughts have been with you and Steve. I hope his treatments have gone well. Terry sends his best as well. We can relate to what you two have been going through these past months. Big hugs to you both. Stunning photographs, it really is wonderful that national parks are there for everybody to enjoy and see such amazing scenery and wildlife. I look forward to future posts and your thoughts. Thanks Ste J. We will be leaving here in another week. I look forward to catching up with you. I really enjoyed your critter pictures. We will be arriving there as you are leaving. Going to spend about 4 days there visiting Pauline and others but mostly the park. We won’t get the intimate experience that you have had however it will feel so good to be back. Wish we would be here when you arrive. We have seen so few people in the area this summer being in LBR. We have also been short-staffed, which has made life a bit more hectic. Hope you and Chris had a great summer. What an amazing collection of photos and experiences you have had this summer LuAnn. Being off the grid so much must be so peaceful and rejuvenating. 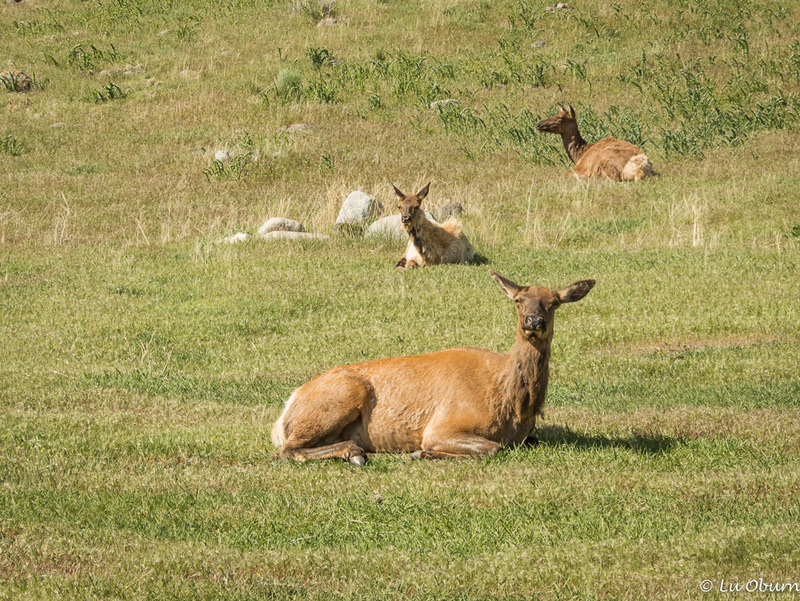 Hi LuAnn, Fantastic wildlife images in one of my favorite parks. 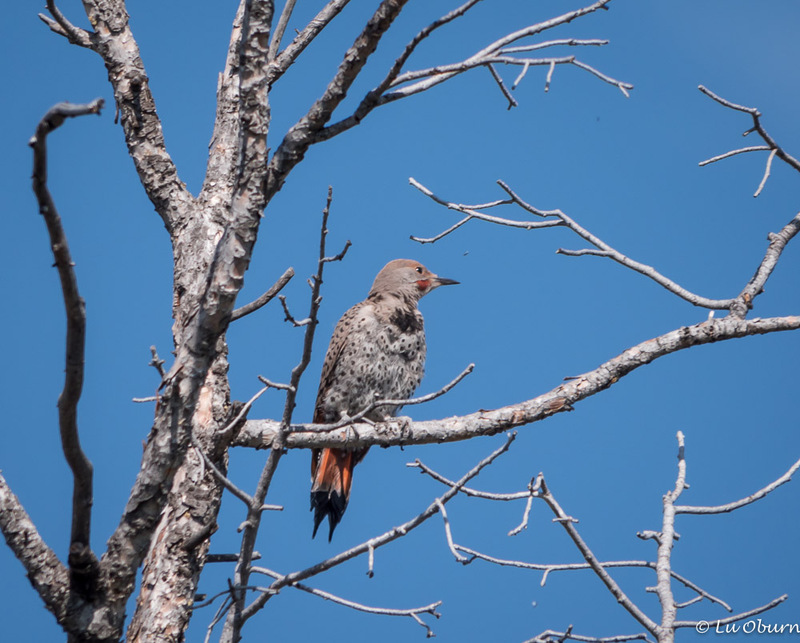 You really have an eye for spotting animals and birds! Thanks for taking me there. Thanks so much Jane and thanks for stopping by.